2018 Update: We still love all the advice on work-life balance in this post — but you may also want to check out our more recent discussion on The Mommy Effect study and whether working moms underestimated the trials and tribulations of working motherhood. Over at Corporette, we recently rounded up some of the top advice readers have shared over the years for women wondering about getting pregnant — the planner’s guide to TTC, if you will. But moms, here’s the question for YOU today: What would you tell your younger, pre-kid self if you could? Is there any other major advice you’d impart to someone who wanted to get pregnant? Would you make any serious changes in your life, either on the family side or the career side, if you could? What’s your best advice on work-life balance, as a working mom, to your pre-mom self? I keep seeing stories like this one and this one where working moms talk about how they were total jerks to their parent coworkers before they had kids, and NOW they get it — why a 4:45 meeting is a bad idea, why you’re not lazy or antisocial if you don’t want to come out for drinks after work, why occasionally your family is more important. On the flip side, I’ve seen many comments from younger readers who are annoyed at all the work/life balance advice at conferences — they don’t think it’s helpful, they don’t think it’ll apply to them, they don’t understand why we constantly complain about it. I also see articles like this one and this one about how women are annoyed when they’re asked about work-life balance as moms. I understand their point if we’re talking about a situation in which there are, say, five parents on a panel and the men are all asked about their backgrounds and work while the only person asked about work/life balance is the mom — BUT, as someone who struggles with work/life balance, I wish it were talked about MORE, among all parents. 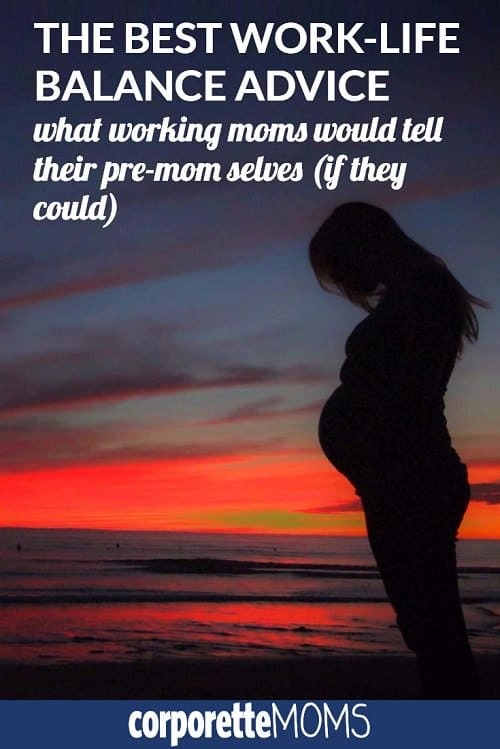 SO: What would you tell your pre-mom self about work/life balance, if you could? What do you wish you had known before you decided to get pregnant? In general, what’s your best advice for work-life balance from a working mom perspective? Lean in. Take chances. Burn the midnight oil and build a great reputation. You’ll want to call in some favors/lean out/get the benefit of the doubt in the future. Smart about buying the house you can afford on one income. We just bought a house and made decisions (like 15-year loan) based on 2 salaries while pregnant with our 1st. Now after becoming a mom I’m completely mentally interested in “leaning-out” of work and wish we had half the house payment we do. Exactly this. Bought a house with 15-year mortgage when we moved to a new city based on my income from previous job. Just had a second kid and craving more time with him, in a job I hate and feel beholden to maintaining income level. So much para. #1. Build that reputation. If in a billable hours environment, hit and exceed your hours as much as you can pre-kids. Be as involved as you can in work-place activities and community activities pre-kids and then ruthlessly cut the ones that don’t interest you as much or don’t advance you as much post-kid. Select the one or two activities which provide the most return on your investment post-kid (be it emotional/social return, or leadership potential). Girlfriend, you have no idea how much free time you have right now. Seriously. The only thing I would want to tell my pre-mom self is to travel. Often. long hours are doable if you are paid enough to hire help and don’t have a facetime requirement. facetime is the kiss of death so pick your workplace carefully. and lean way in before pregnancy (and during if it’s an easy one). Save so much money while you can. Daycare for 1 kid is a couple hundred more than my mortgage, and I have no idea where my money used to go. Relatedly, if you have an HSA, automate pre-tax deposits from your paycheck as soon as you find out you’re pregnant, if not earlier. I didn’t realize that was an option until partway through my pregnancy. I’m maintaining a small deposit every check now but I’ll raise it when/if I get pregnant again. I recommend maxing out your HSA account if you can afford it. Consider it a rainy day fund for healthcare that converts into a retirement account when you are older. Plus, it is tax free. If you are on a high deductible plan and are paying with non-HSA money, you are throwing money away! If you love your job and want to continue to throw yourself into it, then live as close as possible to work. Have excellent childcare and have that be close to work and home, and make most of your life happen in the triangle between (doc and dentist appointments, car repairs, dry cleaners, gyms, grocery, etc). I completely agree with the advice to build your reputation and brand before becoming pregnant. You have much more goodwill banked with your co-workers, which is is much needed when going into pregnancy and the years with young children (so many sick days)! I think it’s hugely important to discuss expectations with your partner, as much as possible. Anything you can think of should be discussed. You can differ on the little things but there are critical decisions for which you MUST be on the same page. The stakes are much higher when it’s your child, so discuss and work out any differences in advance. Definitely research how much childcare costs in your area and make your pre-baby housing decisions with that in mind. What kind of childcare (daycare, nanny, nanny share, family member) and the hours you think you’ll need. If applicable, who is responsible for dropoff and pick-up and making lunches/snacks for daycare. Who makes dr appts. Who stays home when the kid (or nanny) is sick and how to determine that in a way that satisfies both of you. Emergency childcare, especially if your family is not nearby. How long will the non-birthing spouse stay home on parental leave. (If adopting, how long will both of you stay home.) Expectations re: cooking meals, groceries, etc. What tasks you might want to outsource if feasible and desired. In my experience the chore/household task balance changes pretty dramatically once a baby is in the picture so I would revisit that. You’ll be shocked. I can’t get my husband to go to the doctor for himself to save his d@mn life, but kid gets sniffles and he’s asking me three times a day to call the pediatrician. He had us rush baby to the ped ER because baby’s poop was a funny color. She had a virus — she needed to sleep. You know what she didn’t do all day at the ped ER — sleep. People are weird when they have kids. A list to start of a few things that have come up in my circle: vaccinations, childcare options (daycare, nanny, etc. ), parents career hours (do either of you expect/anticipate changes? ), parenting style (attachment parenting vs more traditional), division of labor between parents. Your feelings on some of these may change after the baby actually arrives, so the most critical piece to have a spouse that listens and respects your opinion/feelings. I really did not know what kind of parent I would be, but I’ve tended toward the attachment style (breastfeeding, babywearing, no cry-it-out, etc.) and am very glad that my partner has been open to it. All this advice sounds good – I would add in that I heard “you have no idea how hard it is/ you don’t know what its like/ you don’t understand” so much when I was single and childless that it got to be over the top. I knew that I didn’t know exactly how it would be, I hated hearing it. So I will say this: DON’T WORRY TOO MUCH. I had so many friends that went on and off birth control and probably really screwed with their hormones. I was on birth control for 15 years straight and was so freaked out about getting pregnant at age 38 that I made myself crazy. Absolutely crazy. And I was lucky, because everything was ok. And if it hadn’t been ok – I would have gone to other measures to make a family be it IVF or adoption. Don’t worry, it will all be ok – if you want a family, you can have one. But I spent way too much time worrying about how or if it could happen. Curious about whether this post was prompted by a discussion on the main sister site last week — a junior associate asking about how long she could maintain her current schedule (excellently reviewed work, but wasn’t going beyond her billable hours, and content with the status quo) and getting reamed by fellow posters for not pulling her weight. Multiple posters spoke derisively of those of “mommy status” (blech) counting themselves above late nights and weekend work. It was this given that putting in absurd hours at work was somehow morally superior, even noble. This isn’t really an accurate recap of that post. That OP said she wasn’t even meeting her hours, not that she wasn’t going above and beyond. Meeting your hours is a bare minimum requirement to successfully perform your job. She wanted to know how long she could get away with that without getting fired, and a lot of people answered honestly that it might not be more than six months. I agree with you that working long hours doesn’t make you morally superior or noble, but the fact of the matter is they are expected in Big Law and people who are unwilling to work long hours will eventually be let go. People truthfully told OP that. There was one derogatory comment about lazy mommies and lots of people called that poster out and said the OP’s post had nothing to do with parenthood and it was inappropriate to generalize it that way. I should add the OP had young kids, and that’s what invited the mommy status posts. I think I would tell myself (and still have to tell myself sometimes) that just because you change your mind about what you want or change your priorities, you are still worthy, valuable, and enough. I pinned so much of my self-worth on career achievement that I was sort of devastated when I admitted that it wasn’t all it was cracked up to be and the sacrifices were not worth it for me. And on a lighter note, I’d say that a short commute is the gift that keeps on giving. +1 to the short commute! I would say that it’s OK to change your mind about what you thought you wanted. Work/life balance is so individual and can be highly dependent on circumstances: your personality, your partner’s, your job, your partner’s job, the kid you have vs. the kid you thought you’d have, and the list goes on and on. Be open to different solutions for making it work for your family. Just be aware that everything has a tradeoff and decide which ones you’re OK with. The corollary is to be less judgmental about other parents’ work/life balance. You really have no idea what life is like for them. This. I’m pregnant with our first at 29 and my life looks exactly the same yet so different than 19 year old me thought it would. 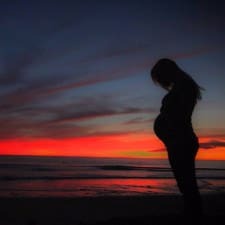 I’m “leaning out” right now, which I never thought I would do, and I’m finding it’s absolutely the right move for me, DH, and our soon-to-be LO. I would also second the suggestion above to build up your credibility and goodwill before kids. I’m able to lean out yet still maintain most of the great aspects of my full-time role (and lose most of the stressful ones) because I was a top performer at the same company for 5 years. I didn’t know I was doing it at the time, but building up my reputation and producing results consistently over that time allowed me to create a flexible work arrangement when I needed it at a company that generally doesn’t offer them because they’d rather keep me in some capacity than lose me completely. After kid #2 it became apparent that either my spouse needed to stay home full time or I needed to leave BigLaw. Reduced hours didn’t solve the unpredictability problem. I ended up moving in house and it’s so much better. +1 here. I had exactly this experience 20 yrs ago. Life has phases. Embrace them. Embrace the change. Make damn sure that your partner is 100% invested in a fair division of labor. Talk about it, plan out who will do what by default, and support each other because each person is losing control of their life to some degree. Also, totally agree on live as close as possible to work if all else is equal (childcare, schools, whatnot)! +1 – and talk about how this *actually* looks! And commit to reexamining how it is working out as things progress. My husband and I were both 100% on board with a “fair division of labor” but it took a few difficult conversations after babies were born to sort out what that meant. Sharing emotional labor took (takes) work. Travel more. Go out more. Say yes to more things. Be aware of the fact that even if you have the easiest pregnancy and the greatest baby this is affecting you in subtle little ways you won’t realize and you should be mindful of that when making decisions and feeling all the things. Waking up once or twice a night for a long period of time takes a toll even if you only wake up for 2 minutes and even if you think you’re fine. Also: enjoy every moment; they all pass before you know it. And totally agree about building a good will reserve with work and friends before you actually have the baby. I appreciate Kat’s comment toward the end of this piece on broadening the conversation to on work-life balance to more broadly include fathers/men. As a mom struggling with work-life balance while my husband is in school, I see the work-life balance question factoring heavily into the work he wants to do in the future so that he’ll be able to spend time with our child. He and I are basically in the same situation – we both work, we both do housework, and we both try to spend as much time as we can with our child. But the work-life balance conversation (and this is my omission as well) often doesn’t include him. It should. Recently, I’ve seen him struggle with this issue as we plan the next few years. My boss, as well, has been a strong advocate for my own work-life balance as he appreciates the issue as a father juggling a demanding job. Some men and some women don’t want to be part of the conversation, but everyone of any gender who does should be included. I think I would tell myself to start having kids sooner. Obviously this isn’t the best advice for everyone. 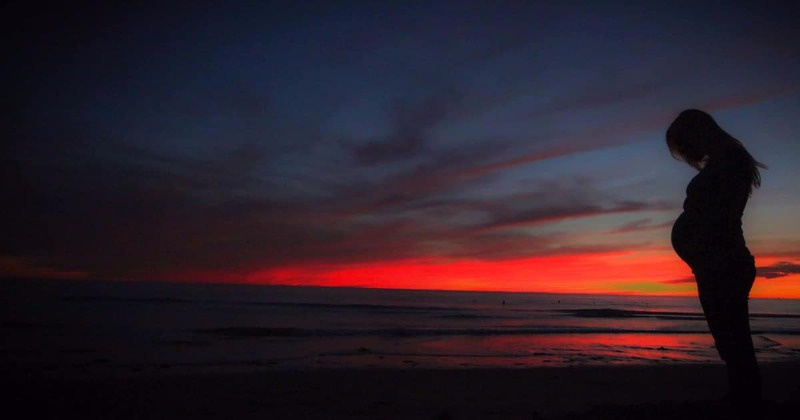 I had my first child at 30, three months after I was admitted to practice law. I had a pregnancy scare the spring before I entered law school and took plan B because I didn’t think I wanted a baby in law school. In hindsight, having a child gave me instant maturity. I think I would have been more focused and disciplined in law school if I had had a child. Time management becomes a necessity, not just a good idea. I also would have had a four year old my first year of practicing law rather than an infant. I read a few years ago that Madeleine Albright tells her daughter that women can have it all, but they often don’t have it all simultaneously. If I could do it all over again, i would have had my children at age 25, gone to law school later on, and focused on my career in my 40s. Obviously this plan isn’t for everyone, but I met my partner when I was 21 and I think sleepless nights would have been easier when I was younger and not so focused on my career. In addition, becoming a mother gave me a maturity that would have been useful in building my career from the outset. I would also tell myself to start our family earlier. We waited and had our children when I was 36 and 38. Looking back on it, having our first baby closer to 30 would have been ideal because we were well-established enough in our careers, were doing well enough financially, and had been married/together long enough to make it a good time to have done it. We had more energy then and it would have been good for us even in our careers. Get tested for celiac. Make health a priority. This will save you years of fertility struggles. This will save you from immune system issues while trying to have a career with an an infant at home.